Trying to improve the health of Americans by taking the advice of the healthcare industry is futile. Barack Obama must set the example of a healthy lifestyle. The solution is to prevent the diseases that the healthcare industry is using as a source of profits and that means fundamentally changing diets and lifestyles. It has taken three decades to attack health by shifting from meat protein and saturated fats to starch, high fructose corn syrup and polyunsaturated (omega-6) vegetable oils. It will take a sustained, personal effort by President Obama to guide a relatively rapid return to a healthy, anti-inflammatory diet. All of the degenerative and autoimmune diseases that form the core of current healthcare diagnosis and treatments are rooted in an inflammatory diet and lifestyle dictated by agribusiness and uninformed by science. The media nags about people eating too much and exercising too little. Our obese population is encouraged to lose weight by eating less. Food fat is demonized. Statins are prescribed with religious zeal to lower blood lipids to reduce cardiovascular disease. All of this “health” advice is wrong and unsupported by the biomedical literature. It is about time for an authority figure, i.e. 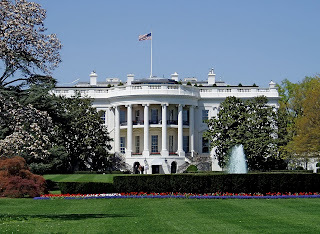 The President of The United States of America, to use some leadership skills and teach people how to eat and live. That would be much easier than trying to get doctors to order fewer tests from their own medical test companies or order fewer images through their own imaging companies. Are the pharmaceutical companies going to suggest that their pills should cost less and be pushed less frequently? Will the insurance companies step out of their lucrative middleman role between doctor and patient? It is more reasonable for The President to use his bully pulpit to change the U.S. diet and lead us back to health. Each meal would come with a source and description of each ingredient and its benefits. YouTube videos of the meal preparation could show the techniques needed. Occasionally The President could be seen enjoying the meal and animation could be used to show why hypoglycemic ingredients were used. Maybe The President would show solidarity to the diabetic victims of industry food fights by getting his finger pricked for a blood sugar test after a meal. It would be good to see him complain about the inaccuracy of several different typical meters. Imagine the close-up of all of the lancet marks needed to convince him that the readings are making sense! This single approach would cost the American people nothing to implement and would save billions of dollars in healthcare expenses over a few years, as citizens of all socio-economic classes changed to diets that were less inflammatory, and degenerative and autoimmune diseases quickly declined. I don’t know why the medical community keeps pushing the low fat diets to modify blood lipids. The medical literature shows that a low fat, high carbohydrate diet (more than 50 grams of starch/sugar in a meal) produces high triglycerides, and a low carb diet ( less than 50 grams per meal), regardless of saturated fats and meat, produces lower triglycerides. In seems reasonable that fats in the diet should mean fats, triglycerides, in the blood, but that ain’t so. It’s the rise in blood insulin in response to a rise in blood sugar due to high glycemic index foods in a meal, that yields high blood triglycerides. The low carb, low triglycerides facts of life were brought to may attention by my wife’s blood chemistry. She knows better, but refuses to follow my preacherly suggestions about an anti-inflammatory diet. She follows most of the use of supplements and prohibitions about vegetable oils, but loves carbs. She eats two thick slices of bread in a sandwich and I cut a thinner slice and eat mine open-faced. I can’t eat her pancakes or French toast. Ok, I eat lots of dark chocolate, but I don’t have flavored syrup in my lattes. One month later, her blood work showed triglycerides down 57% to 127 mg/dl. Individual results may vary, but this is pretty straightforward. Carbs are important -- avoid them. The food pyramid is for chumps. The highest glycemic food you will encounter is a French baguette (95), compared to pastas in the 30s or table sugar at 70. Vegetable oils (most are rich in omega-6 oils, except olive oil) are inflammatory. Starch and sugar increase blood triglycerides and are only needed to gain or keep body fat. Losing weight is much easier without starch/sugar. Most people are deficient in vitamin D and C (even with plenty of solar exposure). High fructose corn syrup is ten times more damaging than starch/sugar, and is especially bad for diabetics. It doesn’t raise blood sugar as much as starch, it just causes damage, e.g. glycation, at an extraordinarily high rate. It also ages skin by accelerating cross-linking of collagen. Very bad stuff even in fruit juices. Eating plant anti-oxidants protects unsaturated fats as they pass through the oxidizing environment of the stomach, so nuts are better unroasted and eaten with veggies. The second interesting observation is that the mouse, cat, dog, etc. versions of the human autoantigens lack the basic triplets. This suggests that these diseases cannot occur in non-primates by the same mechanisms. So what is the role of these basic triplets in humans? They didn’t evolve to cause problems under unusual conditions of chronic inflammation, so what is their adaptive advantage? I think that the answers to these questions could yield the identification of a fundamental cellular transport process and associated cellular phenomena that could be worth a Nobel prize in medicine and it could be unravelled by a group of high school kids doing some straightforward bioinformatics. I put the surface on the IL-1 beta and left the IL-1R wrapping around it in as a ribbon. 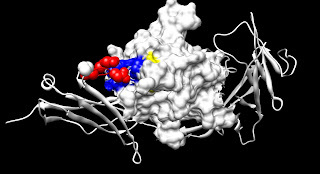 The basic triplet of IL-1 beta is in blue and the acidic quartet of the receptor is in red. One of the basic amino acids is stabilized by hydrophobic bonding over the face of a tyrosine, in yellow. Clearly, there is a simple ionic, plus-minus charge, bonding between the basic and acid amino acids. I don’t normally see this interaction between basic heparin-binding domains and other proteins. 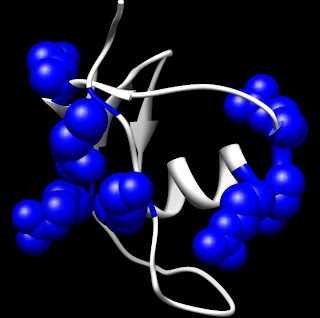 Other proteins that bind to heparin-binding domains use aromatic amino acids to make hydrophobic bonds with the hydrophobic arms of the basic amino acids, e.g. 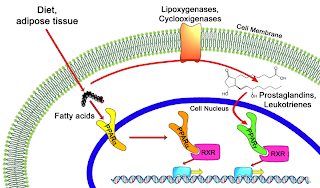 importin and nuclear localization signals or tryptophan/arginine ladders. The use of simple acid-base connections (with the projection of each stiffened by adjacent prolines) shows that this interaction is selected to be irreversible. I don’t know all of the ramifications of basic triplets, but they are very important and are the basis for most modern allergic and autoimmune diseases. Celiac, gluten intolerance, causes intestinal inflammation and immunological presentation of the common intestinal protein, tissue transglutaminase (tTG). The result is anti-tTG autoantibodies that stimulate an immune attack on intestines and other tissues. Those familiar with my blog know that I am obsessed with heparin-binding protein domains. The reason that I am focused on these parts of proteins, is because most cells rapidly sweep heparan sulfate polysaccharides across their surfaces from sites of secretion to sites of internalization. During inflammation, proteins with strong heparin-binding domains, consisting of triplets of basic amino acids, e.g. KRK (lysine-arginine-lysine), are internalized along with the heparan sulfate. The result is an aberrant presentation of these internalized proteins to the immune system and production of inappropriate antibodies, e.g. autoantibodies. One of my hobbies is checking for the unusual occurrence of basic triplets in autoantigens and allergens. I have found dozens of examples. The most recent is associated with Hashimoto’s Thyroiditis. I knew that attack on the thyroid was common in celiacs, because the celiac autoantigen tTG (it has a basic triplet) is also present in the thyroid and the celiac autoantibodies to tTG also cause an attack on the thyroid. 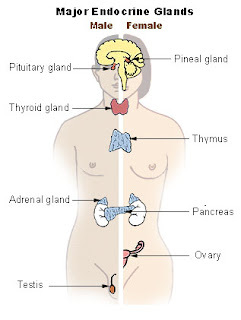 But the autoantigen for Hashimoto’s Thyroiditis is thyroid peroxidase (TPO). I was momentarily perplexed, but then examined the TPO amino acid sequence and immediately found a couple of basic triplets (KKR and KRK). Then, I did a PubMed search for “celiac and Hashimoto’s”. As expected, there is a recent paper (see below) that shows that celiac commonly leads to Hashimoto’s Thyroiditis. An obvious explanation is that the initial attack on the thyroid by anti-tTG autoantibodies of celiac leads to thyroid inflammation and presentation of TPO, with a second round of autoantibodies produced to TPO resulting in Hashimoto’s Thyroiditis. Celiac may be the initial autoimmune trigger for many other autoimmune diseases and allergies. Autism has been associated with maternal autoimmunity and placental abnormalities. Guess where tTG is found in high abundance? Bardella MT, Elli L, Matteis SD, Floriani I, Torri V, Piodi L. Autoimmune disorders in patients affected by celiac sprue and inflammatory bowel disease. Ann Med. 2009;41(2):139-43. There are numerous unanswered questions in modern medicine. What is aging, for example? Why do people become more inflamed as they age? What’s with all of the chronic, degenerative diseases? Why is lipid metabolism (LDL, HDL, triglycerides) linked to degenerative diseases, along with immune system function and inflammation? I am only going to start the answers here. Hydrogen sulfide (H2S), endorphins, hibernation, nuclear receptors (PPARs), antibiotics, chronic inflammatory diseases (fibromyalgia, arthritis, chronic fatigue, Lyme, Morgellon’s, Alzheimer’s, prostatitis, pancreatitis, cancers, etc. ), autoimmunity, leaky gut/kidney/brain barrier, autism and H1N1. Maternal autoimmunity is linked to autism. Autism is linked to leaky gut and chronic inflammation. Gut/kidney/brain barriers are based on integrity of extracellular matrix (heparan sulfate) that is compromised by inflammation. Chronic diseases require inflammation and circulating inflammatory cytokines (TNF, IL-1, IL-6) are elevated..
NSAIDs induce leaky gut and release of bacteria toward liver. Phagocytosis of bacteria leads to transport of some bacteria, e.g. Chlamydia pneumoniae to other sites of inflammation, e.g. gut to joints. Opiods can induce hibernation in rodents. Sulfides can induce hibernation in rodents. H1N1 my cause lethal pneumonia by lung cytokine storm. Inflammatory cytokines and inflammation result from activation of NFkB. Hibernation involves PPARs (another nuclear receptor transcription factor). Omega-3 fatty acids reduce inflammation via COX-2 prostaglandins, but also by binding to PPARs. For most of the diseases under consideration, suppression of inflammation will eliminate symptoms. Antibiotics can impact all of these diseases in unpredictable ways. In some cases complete remission can be achieved and in other cases antibiotics can produce lethal cytokine storms. Bacterial cell wall components, e.g. lipopolysaccharide, lipid A, are intensely pyrogenic, i.e. inflammatory. The role of bacteria in numerous diseases, including cancers, has been proposed since the early isolation of bacteria from human tissues. Many of these bacteria are difficult to culture and have variable forms viewed by microscope. Because these bacteria are difficult for microbiologists to handle with conventional approaches, their existence and significance has always been questioned. Use of antibiotics to treat chronic, inflammatory conditions has seemed inconsistent with the unproven existence of a bacterial cause. Thus, there is surprise when the inappropriate use of antibiotics leads to a cure. I think that the fundamental problem is the assumption that human tissue is sterile, i.e. free from microorganisms, such as bacteria, unless there is overt infection. Part of the sterile assumption derives from the intense inflammatory response to bacteria. In order for bacteria to survive in tissue, the bacteria must suppress inflammation and the tissue must tolerate the slow leaching of inflammatory bacterial materials. Based on the cryptic bacterial infection hypothesis, many, if not all chronic diseases are initiated by inflammatory events that release bacteria into the blood stream carried in phagocytic cells. The cells migrate and take up residence at a region of inflammation. The bacteria produce molecules that produce tissue hibernation and quell local inflammation in response to the bacteria. The bacteria are, however, a source of ongoing irritation to the tissue and a chronic inflammatory disease results. Antibiotics would be a typical choice for killing infecting bacteria. In the case of cryptic, chronic infections, however, application of therapeutic antibiotics may be problematic. The established infections may have produced privileged locations isolated from the vascular system and protected by a bacterial community, e.g. a biofilm. Alternatively, the death of the bacteria and release of pyrogenic factors my produce life-threatening inflammation, that requires careful support. The compromise of tissue inflammation in response to cryptic bacteria is similar to the physiology of rodent hibernation. In both cases, systemic inflammation is suppressed. At the cellular level, this means that other signaling pathways silence the inflammatory NFkB expression pattern. One of the major nuclear receptors that is activated in hibernation is PPAR. PPAR is activated by opiods and H2S, which also induce hibernation in rodents. There are numerous analogs, inhibitors and H2S donors that could be used to disrupt hibernation (free local suppression of inflammation) or reduce symptoms by suppressing systemic inflammation. Inflammation causes a disruption of the integrity of the endothelial extracellular matrix at sites of local inflammation. NFkB activation shuts down the expression of genes involved in heparan sulfate proteoglycan (HSPG) synthesis makes the tissue/blood barrier leaky. Locally this facilitates the recruitment of lymphocytes and neutrophils for defense, but systemically it leads to leaky gut/kidney/brain barriers that permit bacteria to cross. The central approaches to attack cryptic infections are a combination of antibiotics and suppression of cytokine storms. These approaches are used in Marshall’s Protocol [http://bacteriality.com/ ], which also exploits a vitamin D receptor antagonist, Olmesartan, that also inhibits NFkB and inflammation. These approaches are similar to the lengthy use of antibiotics for the treatment of chronic Lyme disease. It is very interesting to note that some of the most effective treatments for a long list of degenerative chronic diseases, autoimmune diseases and cancers, use essentially the same protocol that should attack cryptic bacteria and provide support for ensuing inflammation. The goal seems to be to reduce inflammation and reduce disease, but it isn’t that simple. Inflammation is not bad. Chronic inflammation is the problem for degenerative diseases. After all, inflammation is just what we call the mobilization of our immune system to fight infection. The problem is that inflammation needs to be properly controlled to be invoked only when needed, to be kept localized and to be brought to a proper conclusion. A recent article extended studies of fish oil and various types of infections, to influenza. It used a mouse model that focused on the local, lung aspects of flu infection. Some mice were fed fish oil in a 4:1 ratio to corn oil (fish group) and the controls were just fed corn oil (corn group), as the lipid part of the diets. Both fish oil and corn oil groups got sick when exposed to flu virus. The lungs of the fish treated group were less inflamed, but there was more virus and an increased death rate. The fish oil effectively reduced inflammation, but the inflammation in the corn oil, inflamed, mouse was useful in controlling the spread of the virus. Does this mean that chronic dietary inflammation is protective? 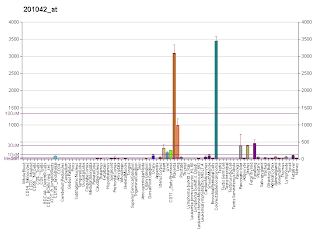 How close does this mouse system model human H1N1 infections? A lot can be learned from animal models, but not all aspects of the human disease are reflected in this model. There is no single H1N1 strain, for example. Flu viruses mutate thousands of times faster than even the most variable bacteria. Thus, people in various parts of Asia may be experiencing a different H1N1 than people in South America. Some H1N1 infections involve organs other than the lungs and cytokine storms can also be deadly. If H1N1 is raging, is fish oil a good idea? It would be prudent to reduce other sources of inflammation, by eating an anti-inflammatory diet and getting plenty of exercise. The answer would seem to be to use only enough fish oil to reduce remaining symptoms of chronic inflammation, e.g. aching joints. The mouse model may have reduced the ability to produce an inflammatory response beyond elimination of chronic inflammation. Most people who eat a high carb diet, with the typical inclusion of vegetable oils, starch and high fructose corn syrup would probably benefit from fish oil supplements, even in the context of influenza risk. It would take a lot of fish oil to compensate for the other inflammatory parts of their diet. Obesity is both a symptom of dietary inflammation and a source of chronic inflammation. Reluctance to engage in physical activity is another indicator of inflammation. It would be helpful if epidemiologists studying the H1N1 swine flu pandemic would determine if chronic inflammation is a risk or benefit in surviving the disease. It would also be helpful to know what simple dietary or other interventions, e.g. nicotine, caffeine, would be helpful for various symptoms of the disease. Pancreatitis is an inflammation of the pancreas resulting from lack of adequate inhibition of proteases. Autoantibodies against PSTI would explain some forms of pancreatitis. I was researching the maintenance of baby gut flora by mother’s milk, when the reference discussed here was brought to my attention by my wife, who happens to be a lactation consultant. The paper showed that PSTI is present in colostrom, the first milk that a baby gets, before the true milk comes in. PSTI protects the new gut from digestion by its own pancreatic proteases, since PSTI is a protease inhibitor that sticks to the gut. The basic triplet (RKR,arg-lys-arg), from my perspective, should result in presentation to the immune system during high levels of inflammation, and as a consequence result in autoantibodies against PSTI. The result would be the neutralization of the protease inhibitor and damaging production of active protease to attack the pancreas, i.e. pancreatitis. It would be fairly easy to test this hypothesis by looking for the anti-PSTI antibodies in some people with pancreatitis. Other autoantibodies, e.g. against tissue transglutaminase, might also be checked, because the inflammation that produced one autoantibody may produce others and both PSTI and tTG are produced in the intestines. In fact, celiac may be the cause of some cases of autoimmune pancreatitis. Raina A, Greer JB, Whitcomb DC. Serology in autoimmune pancreatitis. Minerva Gastroenterol Dietol. 2008 Dec;54(4):375-87. Patel RS, Johlin FC Jr, Murray JA. Celiac disease and recurrent pancreatitis. Gastrointest Endosc. 1999 Dec;50(6):823-7. Marchbank T, Weaver G, Nilsen-Hamilton M, Playford RJ. Pancreatic secretory trypsin inhibitor is a major motogenic and protective factor in human breast milk. Am J Physiol Gastrointest Liver Physiol. 2009 Apr;296(4):G697-703.